1) Can you give me some insight to your childhood? Where did you grow up and what drew you to the film industry? I grew up about 30 minutes north of Boston, the second of four children. As far back as I can remember, my father would show us old movies on his 16mm projector. He would set up a screen in the living room and make us popcorn on the stove. We’d spend hours watching the Three Stooges and Charlie Chaplin and old classics like “The Juggler,” and “The African Queen” and “Treasure of Sierra Madre.” So from a very young age, cinema had already made its way into my bloodstream. Within a few years, I had commandeered my dad’s video camera and began making short films with my brothers and friends. That passion stayed with me through high school and into college. 2) What made you choose Quinnipiac? 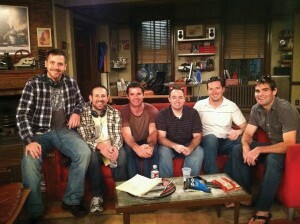 George Sloan (second from the left) on set of ‘How I Met Your Mother’ with other staff members. I was rejected from every film school I applied to — Ithaca, USC, Florida State — but I decided to go to Florida State anyway, and try to transfer into their film program as a sophomore. But it wasn’t meant to be. I didn’t end up liking FSU or Tallahassee. My friend from back home, however, did enjoy his first year at Quinnipiac and suggested I visit him during my winter break. I fell in love with the place and decided to transfer there as a sophomore. Although Quinnipiac didn’t have a proper film school, I was impressed with their mass communications program, specifically the fact that they allowed their students to borrow video production equipment to work on their own personal projects. 3) How long after graduation did you pack up and move to Los Angeles? After graduating in 2004, I moved back home to Massachusetts and began working various jobs, some film-related, some not. I volunteered on commercials and and film sets whenever I could, which eventually led to a few paid jobs. But it was clear that the Boston film industry wasn’t booming and I knew that if I was ever going to have a successful career in film or television, I needed to move to Los Angeles. So I packed up my car and headed west. In retrospect, it was a bit crazy moving to L.A. with no savings and knowing almost no one and not having a job lined up. But I think you almost need that level of obliviousness and naivety, otherwise you’ll talk yourself out of moving. 4) What were your first jobs in L.A.? When I first arrived in Los Angeles in 2006, a friend got me on a low-budget independent movie as a production assistant. I moved from indie film to indie film for a while, making about $50 a day, working no less than 12 hours each day, sometimes as much as 18. To put it bluntly, it sucked. I was working on movies that I never would’ve wanted to see in the theater and working with people who didn’t love what they were doing. I picked up a string of random jobs, working one day on Ghost Whisperer and the next on Nickelodeon Kids’ Choice Awards. There was no routine and it was really starting to grate on me. The low point was working on America’s Next Top Model as a night PA. My job was to put gas in all the passenger vans while the rest of the crew was sleeping. But a breakthrough came when I interviewed and got the job as an office PA on the movie “Rush Hour 3.” Say what you will about the end result of that movie, but it was my film school for 8 months. Every day I learned the ins and outs of a giant Hollywood production. Eventually, I became impatient and decided to move on. After a year of more unstable jobs, I finally received a call from a former boss that “How I Met Your Mother” was looking to hire a PA for the summer. I got the job and within a few months I had been promoted to writers’ assistant. Four years later, my bosses decided I was ready to take on writing an episode. 5) Can you give me some insight into the writing process for an episode of “How I Met Your Mother”? The opportunity to write and episode of “How I Met Your Mother” was about six years in the making. In fact, the table read for my episode happened exactly six years from the day I left Massachusetts. The writing process on our show is a pretty well-oiled machine, but it’s a somewhat long and complicated process. There’s no set amount of time it takes to write a particular episode, but normally this is how it goes: the entire staff of writers works together to “break” a story. They discuss various ideas and talk about where the characters are currently and where they want them to end up. Often one of the showrunners will be in the room to guide the conversation. As the theme and story beats begin to reveal themselves, one of the writers will start to make an outline on the dry erase board so that we can see how everything is coming together. The writers will focus a large portion of their time on coming up with interesting act breaks, the moments just before the commercials, where it’s most important to keep your viewers tuned in. Within a few days, the board will be filled with dozens of story beats, the three acts of the episode will be full, and whoever has been assigned to write that episode goes away for a few days to write an outline. The outline will be 6 to 10 pages and uses all of the information the staff came up with, as well as new information that the writer had to fill in along the way. When the outline has been approved by the studio (20th Century) and the network (CBS), the writer goes away for about a week to write a first draft of the episode. Upon completion of the first draft, the writer is given notes by the showrunners and goes off to write a second draft. When they return with the second draft, the entire staff of writers reads the draft, makes notes and then gathers in the writers’ room to begin the rewrite process. Dialogue will be tightened, act breaks will be clarified and jokes will be “punched.” The goal is to get the script ready for the Monday morning table read, where the cast and executives gather to hear the script read aloud for the first time. After the table read, the staff goes back to the room to rewrite some more, fixing the things that did not work at the table read. On Tuesday, everyone goes down to the set to watch the actors perform the script like a play and then the script is once again rewritten in order to fix whatever problems may have appeared during the run-through. Finally, on Tuesday night, the writers’ assistants send out the final draft of the script to the entire cast and crew. The episode is filmed Wednesday through Friday and then gets edited the following week. Within a month, the show is on the air. 6) What are your plans for the future as far as writing for “How I Met Your Mother” and your future goals? My plans for the future are to stay on “How I Met Your Mother” as long as they’ll have me. I hope to be able to write another episode next season. If it makes it to a ninth season, maybe I could get promoted to being a staff writer. But it’s impossible to say for sure. It’s not even clear to us at this point if we’ll be on the air after next season, so my future is somewhat dependent on whether or not we stay on the air. My lifelong goal, however, has always been to write and direct movies, so I hope to one day move in that direction. I think it’s great to set short and long-term goals for yourself, but I also think it’s important to stay open to the idea that life often unfolds in unexpected ways. Writing for television was never something I had planned on, but it’s been a wonderful discovery, and one that I hope to enjoy for a very long time.